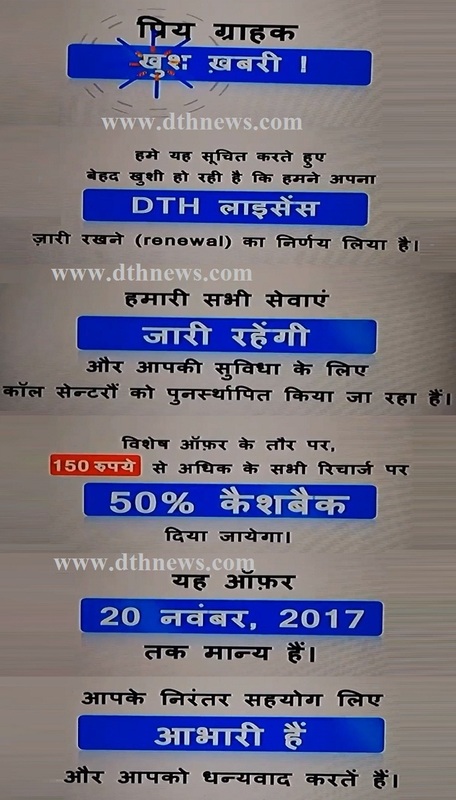 As per Reliance Digital TV DTH “We are delighted to announce that we are renewing the DTH License. All our TV Services will continue un-interrupted and for your convenience Call Centre Services are being restored. As a special offer, we will provide 50% cash for all recharges above Rs.150. The offer is valid till the 20th of November 2017. We Sincerely Thank You for your continued patronage." This massage is showing on TV screen. As you know Reliance Communications is selling its direct-to-home (DTH) Reliance BIG TV, to Veecon Media and Television. So it is good news for Reliance Big TV 1.2 million customers, they will continue to enjoy uninterrupted services.